Kyle Rudolph‘s talent has never been in question, but inconsistency and injuries have frustrated his emergence as one of the league’s more dangerous tight ends. He certainly made his mark against the Lions, grabbing two touchdowns and a bucket load of big plays. At times he was left all alone off play action, slashing Detroit’s aggressive defense, but he appeared well marshaled on the game’s defining play. Approaching the half, Kirk Cousins was able to get just enough flight on a midfield hail mary to find the end zone. Rudolph muscled his way into position and made a leaping grab to give the Vikings the lead. Minnesota had struggled up to that point but didn’t look back after that. Dalvin Cook changes the Vikings’ rushing attack significantly. His vision and burst on outside zone runs puts the offense ahead of the chains, setting up manageable down and distances. It also opens up the play action game, on which much of the offensive success depends. The Vikings opened the game with play action, coming back to the same look but this time handing off on the ensuing play. Perhaps it took time for the offense to lay the traps they used so well later in the game, but Cook’s contribution cannot be overstated. He wore down the Lions, allowing Minnesota to pull away. The Vikings had some struggles with Kenny Golladay early, but once they switched Holton Hill onto him, Detroit’s lone receiving threat was nullified. Hill did an excellent job of staying physical to prevent separation, all while not getting too handsy and taking penalties downfield. Harrison Smith lived at the line of scrimmage and made life miserable for the Lions on both run and pass plays. He notched multiple run stops and even batted down a ball on a pass rush. The Lions simply don’t have explosive options on offense outside of Kenny Golladay. Matthew Stafford was forced to rely on timing routes to the boundary all afternoon and rarely found a secondary or tertiary target breaking open. LeGarrette Blount offered little value on the field today, especially as a receiver. He had two drops in the first half, and in the second, he notched two receptions for a combined -5 receiving yards. The Lions won the line of scrimmage early in the game, particularly with Ricky Jean-Francois, who got the better of Mike Remmers. Damon Harrison did not enjoy his best game despite some impressive flashes, but Detroit lacks firepower aside from him. The lack of depth was evident as the game wore on, with the Vikings beginning to take over up front. Ziggy Ansah‘s injury has deprived them of their top pass rusher, forcing Detroit to bring extra rushers. They got burned for it at times this Sunday. Jarrad Davis needs to excel in space for the Lions’ defense to thrive. He was unable to corral Dalvin Cook a number of times in the second half, despite finding himself unblocked in the hole. Missing tackles turned minor gains into first downs, helping the Vikings find a rhythm they never lost. Ill-discipline and some harsh penalties kept Detroit in the game, but the linebacking corps as a whole kept letting them down. Christian Jones was consistently lost in coverage, struggling against play action in particular. The pair needs to improve for the Lions to build a dominant stop unit. Minnesota: Discovering the ground attack allowed the Vikings to control the game, helping them to a five-point half-time lead despite four three-and-outs. The deep play-action game opened up after that. 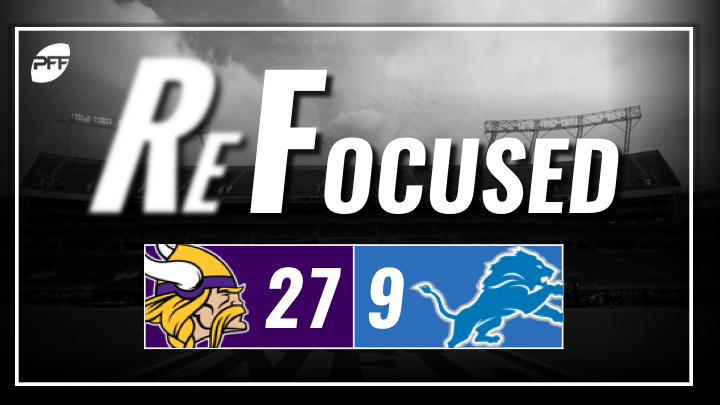 Detroit: The Lions simply lacked the skill players on offense to be competitive with the Vikings.